Home / Faculties / What is Polytechnic? KPU is proud to be Canada’s only accredited polytechnic university. All of the Wilson School of Design programs embrace the polytechnic spirit. It means that you’ll learn by doing; that your instructors will have strong industry connections; that you’ll use the latest technology; that you’ll get a chance to roll up your sleeves and tackle the real problems and issues that face designers today. It means that you’ll learn relevant skills, then refine them in real-life workplaces. It means that you’ll be part of a supportive environment that will carry you through from the idea to the first draft to the finished product. It means bonding with a cohort of talented designers over late nights, failed attempts and hard-won successes. Learning how to be a world-class designer means making, doing, trying, failing, trying again, building, prototyping, iterating until you get it right. What better place to do that than at Canada’s only polytechnic? That is what polytechnic is all about. The Challenge Dialogue was a year-long project that partnered our Product Design students with business and environmental experts to develop a clean technology working prototype for the City of Surrey. In November 2017, Alisa Yao (Product Design student) travelled to Ottawa as KPU’s student ambassador at Polytechnics Canada’s National Strategy Group Meeting. She pitched her group's clean technology working prototype to the Minister of Small Business and Tourism Bardish Chagger, the Parliamentary Secretary to the Prime Minister Trudeau Peter Schiefke, and to the Parliamentary Secretary of Science Kate Young. She also spent time on Parliament Hill meeting with government representatives focused on youth and young entrepreneur agendas. “Hands-on learning and theoretical learning all come together in studio class and that’s where you apply all the knowledge you’ve gained. For me, it’s the perfect place to work because I get to turn my ideas into reality." 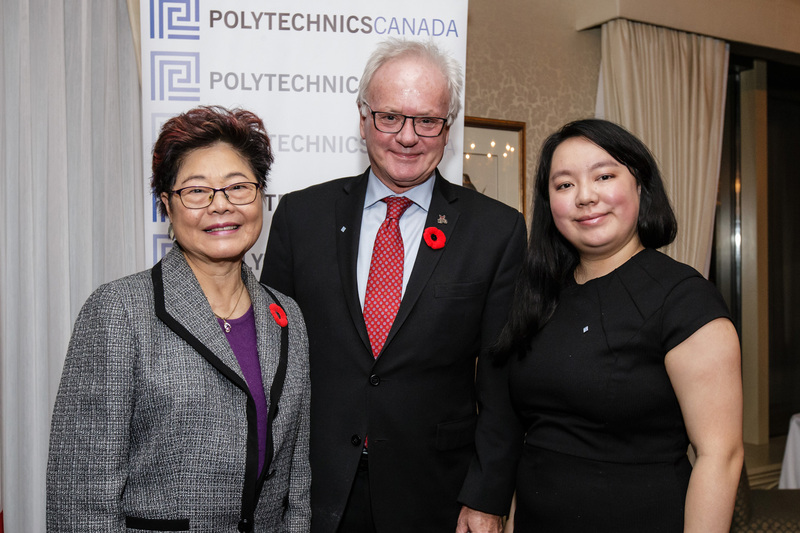 Minister of Parliament for the Richmond Centre Alice Wong, KPU President Dr. Alan Davis and Product Design student Alisa Yao at the Polytechnics Canada National Strategy Group meeting in Ottawa.